Champ in the making! 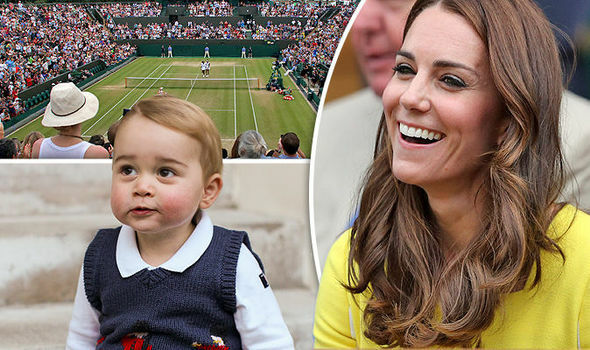 Duchess reveals at Wimbledon how George is ALREADY a tennis fan. The Duchess of Cambridge served up a surprise for tennis fans at Wimbledon yesterday by revealing Prince George is a little ace at the game. Kate told how George – who will be three in two weeks – has his own little tennis racket and has already started playing. Kate and William, both 34, have a private tennis court at their Norfolk home, Anmer Hall. The couple are keen tennis players and regular visitors to the Wimbledon championships. Yesterday Kate let slip to former tennis star Greg Rusedski, that George is also turning into a decent little player. Kate was making her first visit to the championships this year. Before the action started she met players, ball boys and girls and members of the Armed Forces and emergency services. She even managed to produce a smile from Andy Murray's stony-faced coach Ivan Lendl after he was introduced to her. Lendl, 56, said Kate apologised for not having seen any of Murray's Wimbledon matches so far, but asked him to pass on a message to the Scot, wishing him the best. The Duchess was dressed for the occasion in a tennis-ball yellow Roksanda Ilincic wool crepe dress that she first wore on a visit to Sydney's Royal Opera House in 2014. She took her seat in the Royal Box from where she watched reigning champion Serena Williams, 34, defeat Russia's Elena Vesnina 6-2, 6-0. Serena's sister Venus, 36, failed in her bid for a fifth Wimbledon final against her sibling when she lost 6-4, 6-4 in her semi-final against Germany's Angelique Kerber. Kate later met Serena to congratulate her and ended up starring in a video selfie that the tennis star posted on Snapchat. The champion – whose mother, Oracene Price, was also introduced to Kate – said she was not told of the royal visit until after her match. She said of Kate and Sophie: “It was really nice to meet with them. We just had a chat about the matches.” She also gave encouragement about starting Prince George young. “I've been working at this since I was three years old,” Serena said.